The elderly are at high risk for the health-condition-depression because they are more likely than younger people to have experienced illness, a death of loved ones, impaired function, fear and loss of independence. The cumulative effect of aging and negative life experiences can be overwhelming for the elderly. What exactly happens? It is more than just feeling sad from time to time or justifiable fear. It is a condition which robs individuals of joy for a prolonged period of time. According to a study conducted by the American Geriatrics Society from 1999 to 2001, the health-condition-depression can be a risk factor for heart disease and stroke among those persons 65 years of age and older; they were 75% more likely to experience this. 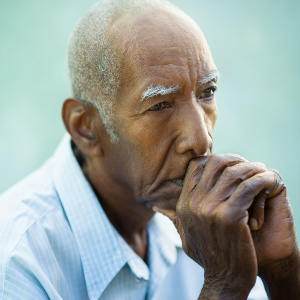 In fact, depression can occur in older adults who experience any chronic medical condition which may cause pain, disability or become life-threatening. While in this state, it may appear permanent, but with proper attention, it can over time be relieved. Have family or friends you check on frequently and they with you. Last of all, if none of this works, seek professional help. Recently it has been discovered that while aging, the hormones of our bodies can create an imbalance. Should there be too much of one hormone and not enough of another the body becomes out of sync and optimal health is affected. This includes your moods, emotional state, and overall well-being. Be sure to make your physician aware of all medications you may be taking because medications have side-effects and the health-condition-depression might just be one of them. The elderly are more susceptible to depression if you are taking multiple medications. It is imperative that your doctor checks for side-effects and drug interactions. You should pay attention yourself when taking your meds to determine if the medication causes you to act differently.